Radio Ranch is a busy place: Frankie and Betsy Baxter’s father Tom co-owns the ranch with “Radio’s Singing Cowboy” Gene Autry, whose daily broadcasts have brought visitors from all over. The Baxter kids also run the “Junior Thunder Riders,” a combination fan club and service organization (after some debate, they settle on “To the rescue!” as their motto) inspired by a mysterious group of riders they once witnessed in nearby Thunder Valley. In addition, Frankie is a tinkerer (with an enviable workshop in the barn loft), assembling electrical gadgets using instructions from Popular Science (and occasionally borrowing parts from the ranch’s radio engineer!). The action begins with the arrival of Professor Beetson and his crew, secretly in search of a radium deposit Beetson believes to be in the area. At the same time, one of Frankie’s devices, a radio signal “direction finder,” indicates that some scrambled signals he’s been tracking for weeks are coming from straight down, somewhere in the depths of the earth. Before the first chapter is over, it is revealed that the mysterious riders, the radium deposit, and the unknown radio signals are all connected to “The Scientific City of Murania” 25,000 feet below the surface, a realm of futuristic marvels ruled by the haughty Queen Tika and whose entrance in Thunder Valley is protected by her royal guard (the “Thunder Riders” the Baxters witnessed, wearing gas mask-like breathing apparatuses while at surface level). It isn’t long before the surface and subterranean worlds collide and the fates of Autry and Tika are entwined! As the story develops, Beetson’s greed (for both radium and scientific acclaim) and the Baxters’ curiosity endanger Murania’s secret. Beetson hopes to get Autry out of the way—if Autry misses a broadcast, he’ll lose his radio contract and the ranch—so that he won’t have any interference in his digging (or have to share any of his finds with the property owners and government). Beetson even goes so far as to kill Tom Baxter and frame Autry for the crime! Queen Tika wants both Autry and Beetson gone for similar reasons: too many visitors to Radio Ranch means risking the discovery of Murania, and their serene kingdom must never be desecrated by the presence of surface people! Little does Tika know, however, that there is division in her own kingdom: her Chancellor, Argo, schemes to overthrow her with a band of rebels, men he has saved from death in the “Lightning Chamber.” Will she succeed in keeping her throne? Will Frankie and Betsy discover the secret of the underground city? 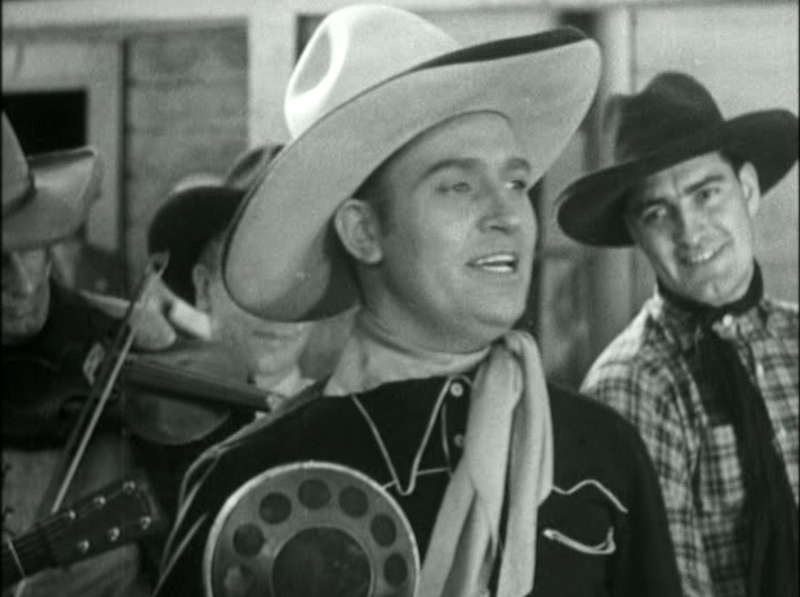 Will Beetson succeed in keeping Gene Autry away from Radio Ranch, or will Autry make it back to broadcast a performance at two o’clock each day? 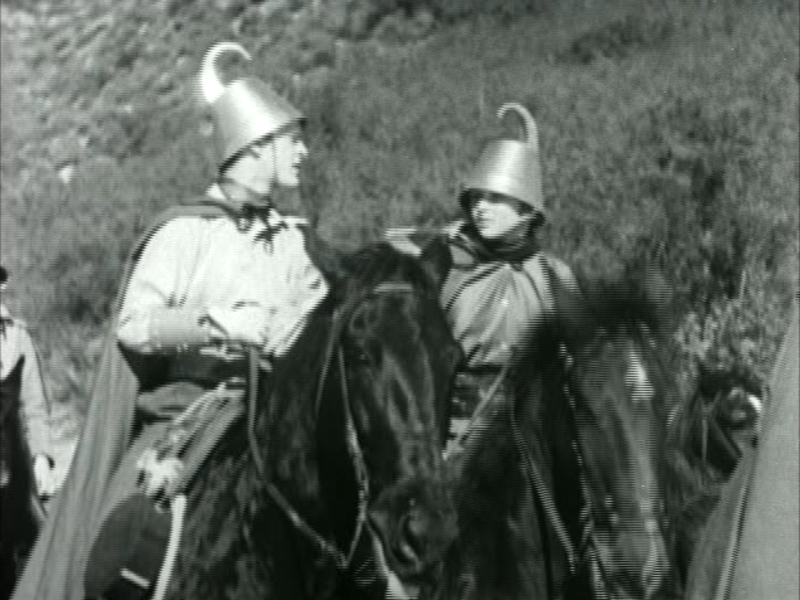 Thus begins the epic twelve-chapter Mascot serial The Phantom Empire, Gene Autry’s debut as a leading man (following his attention-getting appearance in In Old Santa Fe) and one of the strangest examples of the form. This is one I had actually seen before: The Phantom Empire was my introduction to the serials several years ago, and revisiting it in light of my recent exploration has not lessened its curiosity factor. As even this brief summary indicates, there are numerous characters with competing interests to be accommodated by the story, and while some of them fit the profile of stock serial characters—the juveniles, the imperious monarch, the scientist-explorer—both the energy of the performances and the unusual situations in which they find themselves make them stand out as individuals. 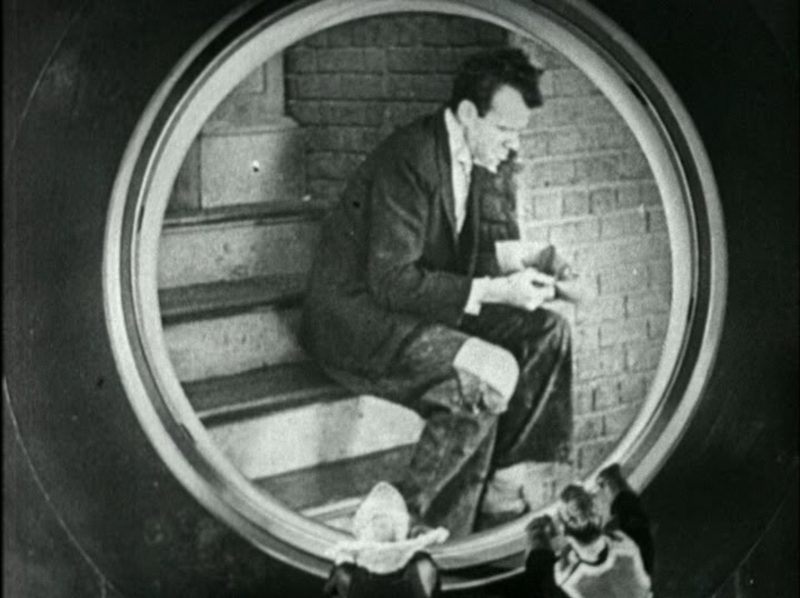 Even the comic relief, provided by Autry’s sidemen Oscar and Pete (longtime sidekick Lester “Smiley” Burnett and Peter Potter, credited as “William Moore,” respectively), is more idiosyncratic than the typical examples (for one thing, they actually help advance the plot). Most pulp heroes are intentionally somewhat blank, more active than reflective, the better for audiences to project themselves onto their characters. 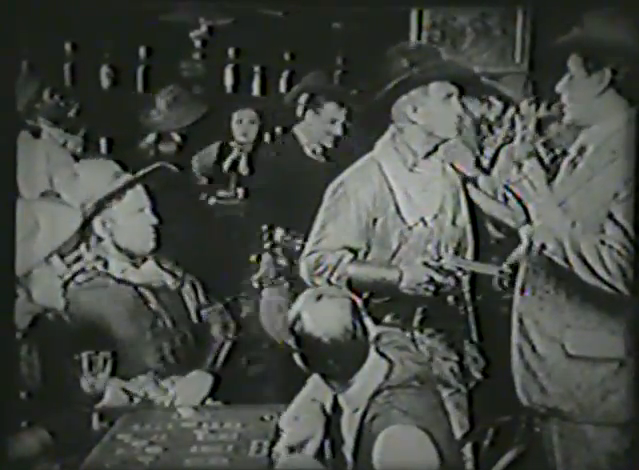 In this case, however, the audience identification characters are clearly Frankie and Betsy (played by frequent juvenile leads Frankie Darro and Betsy King Ross, whom we saw in Fighting with Kit Carson): their leadership of the Junior Thunder Riders (whom they address as part of Autry’s radio broadcast) and Frankie’s do-it-yourself projects are clear appeals to the kinds of young viewers who might throw themselves into fandom, who in the following generations might become Futurians, or members of the Merry Marvel Marching Society, or Trekkies, or Whovians. Were they around today, the Junior Thunder Riders would undoubtedly be attending Comic-Con. 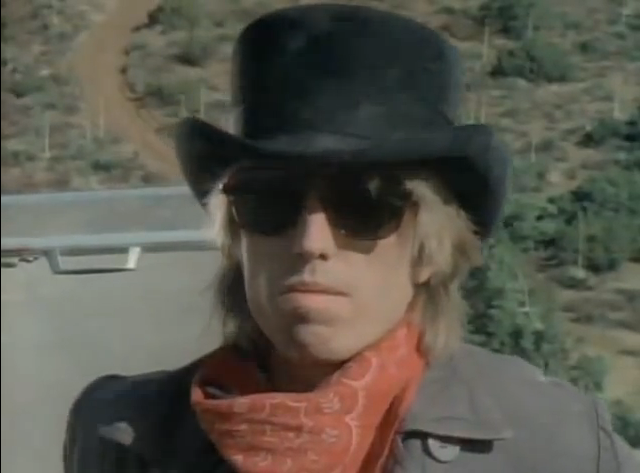 Obviously, the most notable element of The Phantom Empire is its mingling of genres, drawing on the “modern” Western (in which contemporary inventions such as radio, automobiles, and airplanes coexist with horses and six-guns) and space opera (albeit of the inner rather than outer variety). Very little of Murania, with its gleaming art deco spires (reminiscent of both Metropolis and the Emerald City of Oz) and fantastic machinery, including robots and disintegration rays, would be out of place the following year in Flash Gordon. 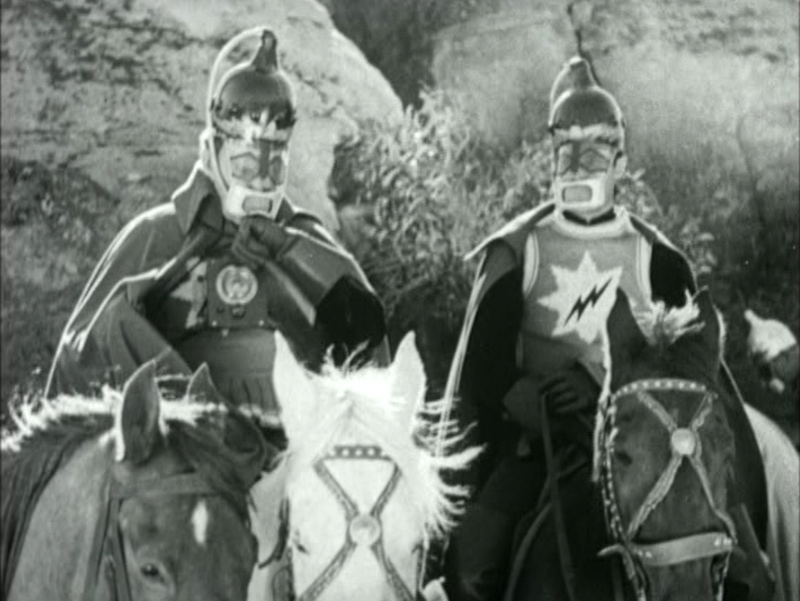 Like the royalty of planet Mongo, the citizens of Murania dress with stagey, pseudo-medieval flair and favor both swords and ray guns for defense. With their flowing cloaks and ornate headgear, it’s no wonder Frankie and Betsy took the Queen’s royal guard as their models for the Junior Thunder Riders. There had been fictional treatments of a hollow earth, or at least of subterranean realms, before, by such authors as Jules Verne and Edgar Rice Burroughs, and underground kingdoms continued to be popular in the science fiction and fantasy pulps. The Muranians are identified as descendants of ancient Mu who went underground one hundred thousand years earlier, fleeing the advancing glaciers of the Ice Age. Separate from the “mad world” above, they cultivated an advanced science based on the abundant radium they found. Even in the 1930s, such beliefs were the territory of fringe science and occultism: I’m sure no one involved thought they were making a documentary, but the backstory indicates that at least one of the writers had been paying close attention to such ideas. In Chapter One, after Frankie’s direction finder has detected the radio signals from underground, Betsy asks Autry, “Say, do you suppose there’s anything to any of those books that Frankie’s been reading, about a world underground, with people and cities and everything?” Without hesitating, Autry replies, “Well, of course there’s something to them,” like a regular reader of Amazing Stories. I am not aware of any claim that The Phantom Empire influenced the form of Shaver’s later revelations, but they both share a paranoid, hallucinatory quality that (in the case of The Phantom Empire) goes beyond the novelty value of merging two such disparate genres. I would venture so far as to say that The Phantom Empire is in many places truly surreal, not just in the colloquial sense of “weird” but in the sense of invoking a dream-like acceptance of seemingly unrelated events, making the strange seem normal and vice versa. 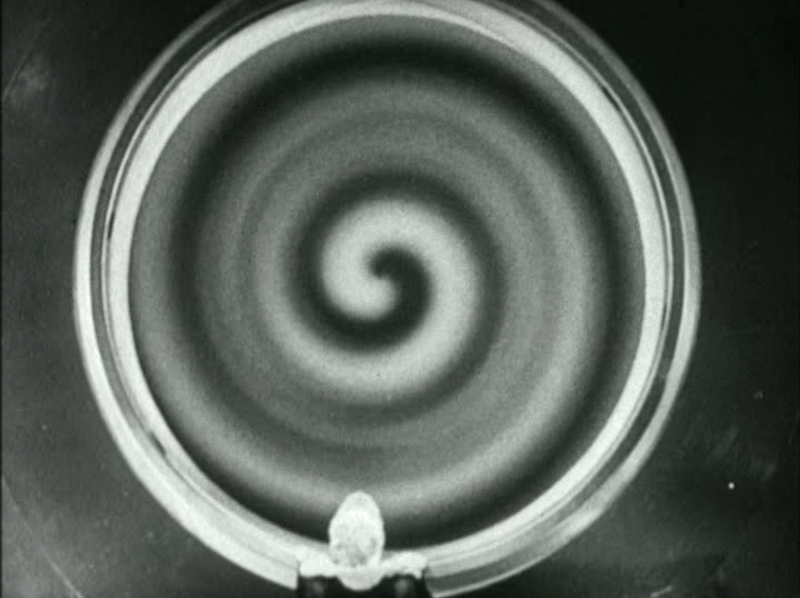 Through the alchemy of film, obvious artifice becomes more vividly real than reality. 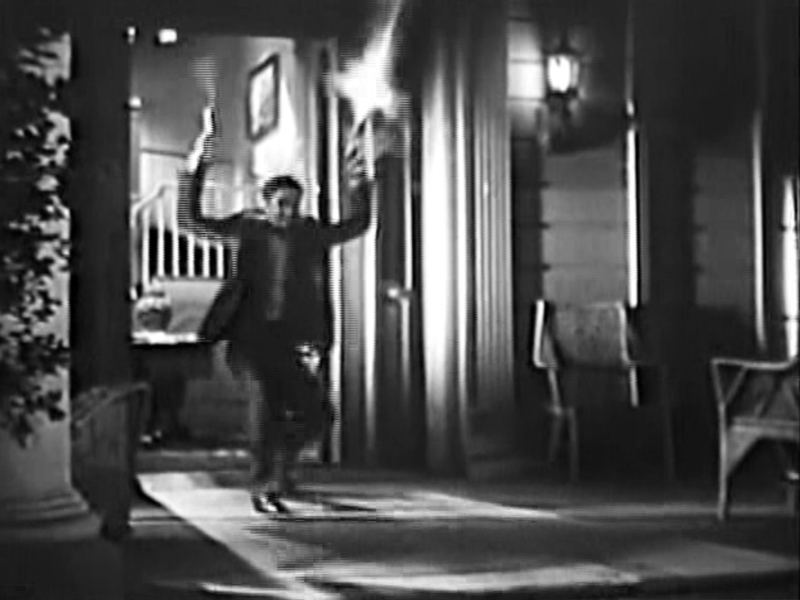 As an example, Autry’s easygoing music, for which he was presumably chosen to headline the production, is often juxtaposed with scenes of mystery or danger, giving it an eerie edge: in Chapter Eight (“Jaws of Jeopardy”) he sings “I’m Getting a Moon’s Eye View of the World” on an airplane while Frankie holds a gun on the unwilling pilot; in Chapter One, his then best-known song “That Silver-Haired Daddy of Mine” is broken up and heard from a distance while Frankie and Betsy use the direction finder in their secret workshop. The moment when they realize the signals are coming from beneath the earth achieves something often reached for but not always grasped in the serials: a sense of wonder, and in that scene The Phantom Empire anticipates the inquisitive child protagonists of Steven Spielberg and other filmmakers of the 1980s. 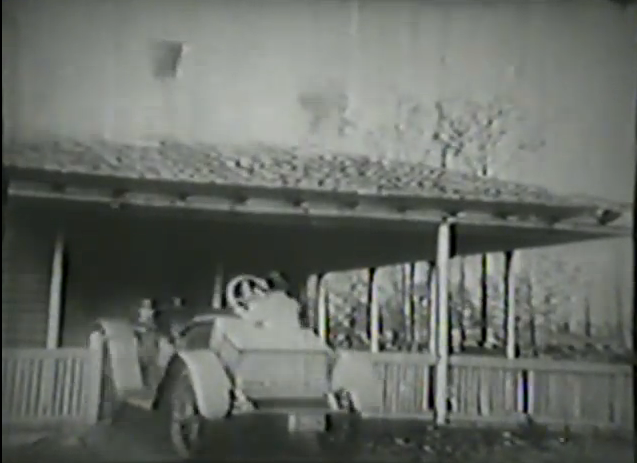 There is a reflexive quality to much of The Phantom Empire, and the borders between narrative elements are permeable: Autry’s daily broadcasts (at least before he is framed) include full live performances of stagecoach robberies and other dramas, supposedly staged for the live audience at the ranch rather than those listening to the radio show, but in ways that play with audience expectation and blur the boundaries between fantasy and reality. Frankie and Betsy address “Junior Thunder Riders” in the radio audience as a way of speaking directly to the film audience. The Queen’s royal guard, nicknamed the “Thunder Riders” by Frankie and Betsy, and taken as the basis of their club, are at first referred to only as the “royal guard;” later as the “thunder guard;” and finally as the “Thunder Riders,” the same as the name given to them by the children. 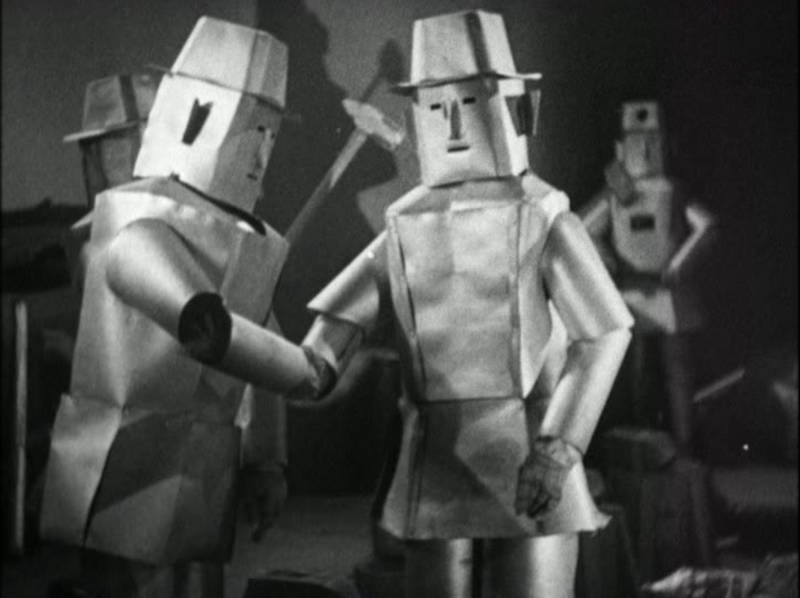 The robots of Murania have what appear to be built-in cowboy hats as part of their design (the logical explanation is that someone in the prop department heard the phrase “science fiction Western” and took it to heart, but I’m more interested in effect than intent); ultimately, two of the robots’ metal bodies are inhabited by Oscar and Pete, real cowboys in disguise. 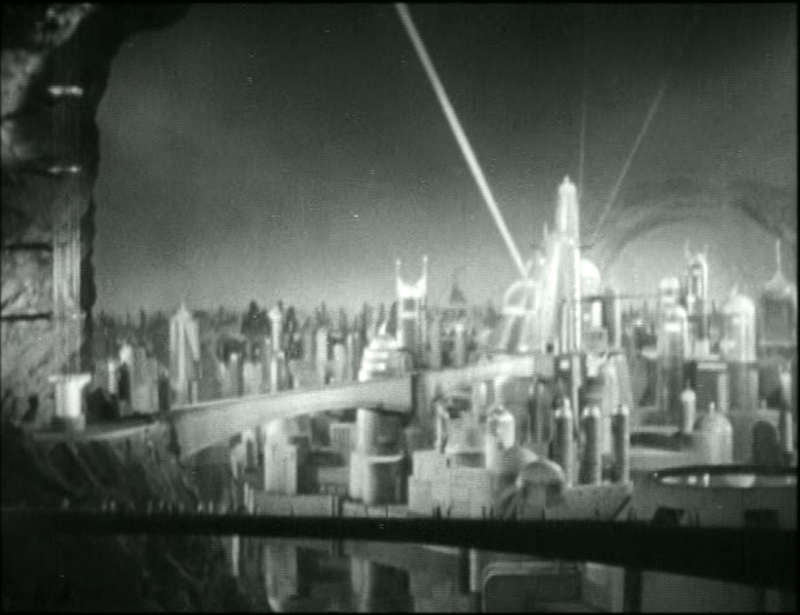 The constant reuse of key sets above and below ground, made possible in part by Queen Tika’s remote viewing from her control room, gives events a sense of circularity: Flash Gordon moves from one fantastic place to another in sequence, but The Phantom Empire moves up and down as capriciously as the city’s sole elevator, always returning to the same locations. Queen Tika’s television viewer contributes to this same dream-like scramble of images: several times she views a succession of unconnected scenes from the surface (stock footage of traffic, boxing matches, and car crashes) in order to express her disapproval: “Fools! Surface people are always in a hurry—their world today is a madhouse. We in Murania are indeed fortunate. Death . . . suffering . . . speed . . . accidents. . . .” Almost everything Tika (played by Dorothy Christy) says is delivered in a tone of high dudgeon: “Do I have to witness this insane material because you are unable to find the Garden of Life?” she demands of her assistant, sounding exactly like an annoyed spouse whose husband continues to flip through channels at random. In one odd scene, Tika takes Autry on a virtual tour of Murania using the viewer, and then contrasts the achievements of her kingdom with a penniless beggar: “Feast your eyes,” she says. “He is from your world; we have none of that here.” Changing the view to Frankie and Betsy, she says, “There are friends of yours. They may become beggars.” In 1935, the depths of the Depression, such a concern was far from academic. 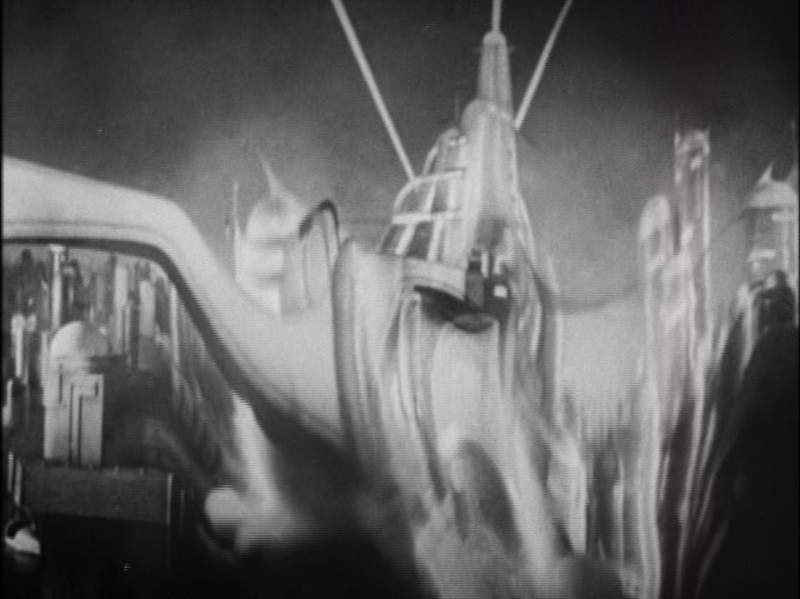 One moment in the final chapter (“The End of Murania”) says a great deal about the production as a whole: the underground city is melting down under the beam of the rebels’ giant disintegrating ray, now out of control. Queen Tika, resigned to die with her kingdom, remains in her control room and throws the switch which will open the hidden door in Thunder Valley, allowing Autry and his surface friends to escape. Hitching up some of the Thunder Riders’ horses, Autry sees the remaining herd and suddenly says, “We can’t leave those horses here to die!” The group takes an extra moment to free all the horses, as if they knew that the young audience they hoped to grab would say, “Hey, Gene! What about those other horses! ?” I admit that, seeing the herd of animals stream out of the hidden door, my heart swelled. Yeah, it’s that kind of movie. Where I Watched It: Timeless Media Group’s 3-DVD set, endorsed by Gene Autry Entertainment and “sourced from Gene Autry’s personal film archive.” There are several versions on YouTube. 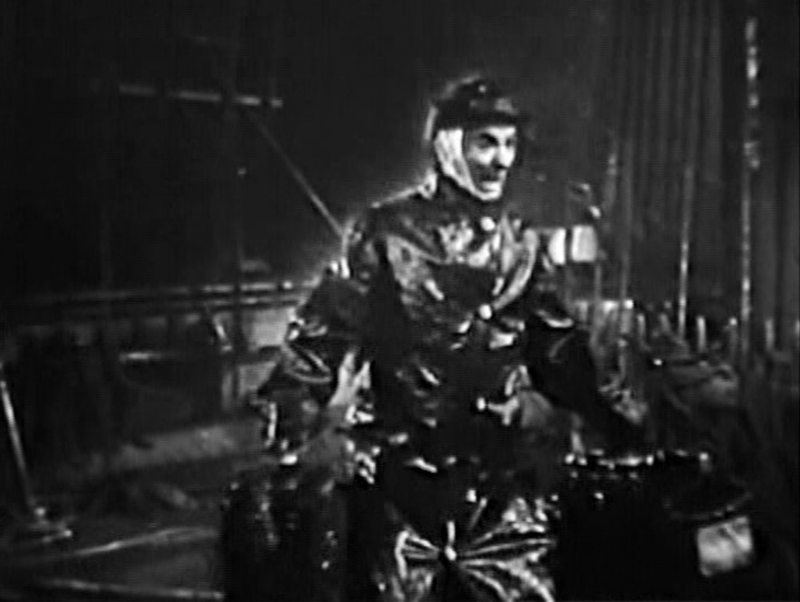 Best Cliffhanger: The bound or incapacitated victim on a conveyor belt, inexorably moving toward death in the form of a buzz saw or furnace, is one of the iconic images of the serials, but I haven’t seen it all that much in my admittedly limited viewing. Perhaps it was already a cliché by the 1930s heyday of the form, or perhaps I just haven’t watched the right examples yet. However, Chapter Ten of The Phantom Empire (“The Rebellion”) includes just such a cliffhanger: following Argo’s overthrow of Queen Tika, Autry attempts to fight his way out of Murania. During a fight in a foundry full of laboring robots, he is knocked unconscious and sprawled onto a warhead assembly line. 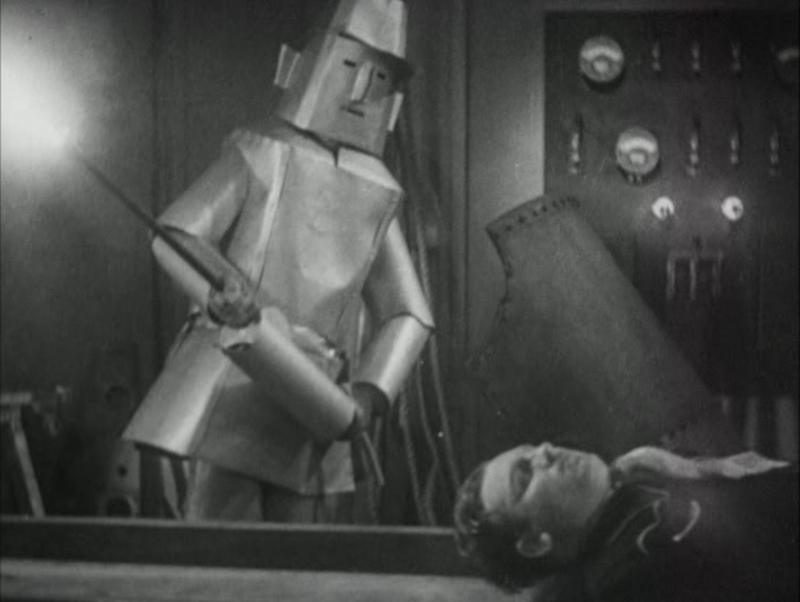 At the end, a robot ceaselessly raises and lowers a welding torch—whether its white-hot fire touches a weld point or Autry’s all-too mortal flesh is of no concern to the mindless automaton. Annie Wilkes Award for Most Blatant Cheat: After his experience in the “radium reviving chamber” in Chapter Seven (“From Death to Life”), Autry escapes into the underground city and gets into a sword fight with a group of guards. Overpowered by one of them, he falls over the railing of a suspended catwalk; at the beginning of the next chapter, he climbs over instead of being pushed, and grabs onto a rail underneath. As cheats go, it’s a small one, but there’s no question the footage is different. Silliest Costume: The assistant who operates Tika’s television is essentially a glorified remote control, but he does serve the Queen directly so I can’t blame him for putting on airs. The bat wings on his helmet are a little much, though. What’s Next: I’ll examine another science fiction adventure, Radar Men from the Moon. Will it be as good as The Phantom Empire? Check back in two weeks to find out! ** Although mostly a footnote now, the Shaver Mystery was a sensation in the 1940s. It was overtaken by fascination with UFOs, but as late as the 1960s a vocal minority of UFO researchers claimed that flying saucers came from inside the earth rather than outer space. I’m not really the kind of book collector who fusses about rare items or first editions; it’s nice to find those sorts of things, and I can appreciate a beautifully-bound book as a work of art in itself, but I mostly think of collecting books as building a library for reference or enjoyment. 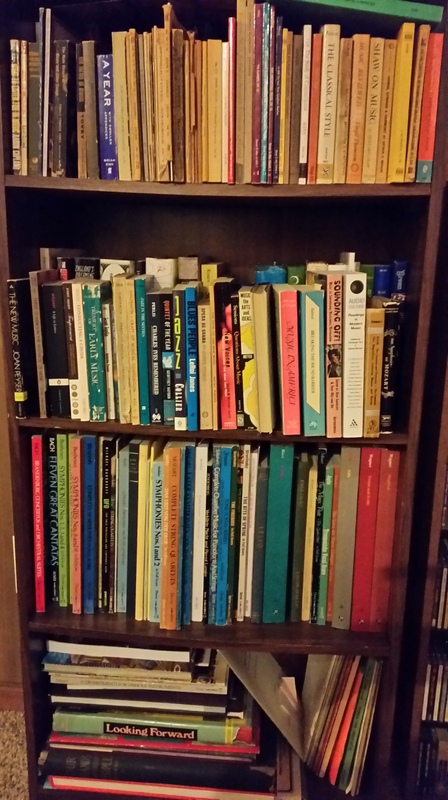 When I was younger, and mostly reading science fiction and other genre material, I would pursue books and authors that connected with one another in some way: the Cthulhu Mythos and the Weird Tales school; or the books listed by Gary Gygax as influences on Dungeons & Dragons; and, later on, steampunk and the nineteenth-century authors who influenced it. 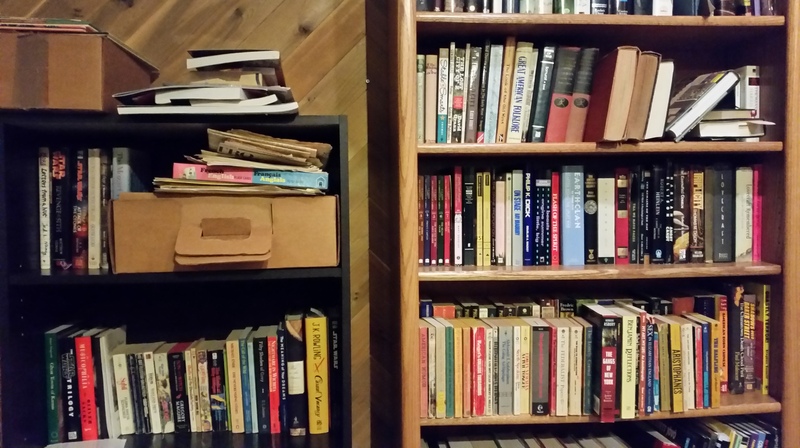 When I became a graduate student and teacher, my library of music books–theory, history, and other kinds of reference–burgeoned. Along the way, I’ve picked up books of art, criticism, and aesthetics that caught my interest. There are different motivations for collecting, and my motivations have changed over the years. One of the first impulses is simply to have a collection as a form of mastery: the completist urge, to have a matched set, to have at your fingertips anything you might want to experience or refer to. This notably affects record collectors in particular, but any kind of collector can fall prey to the need to fill in gaps, to have a satisfyingly whole body of work to dive into or simply stand back and regard. Not unrelated is what we might call the scholarly impulse: as I’ve been discovering over the last ten months, since I started writing this blog, you can only write off the top of your head for so long before you need to pull in an apposite quote or factoid for support. In my case, I’m blessed with a decent memory, good enough to recall something I read years or decades ago that bears on my present topic, but cursed in that it isn’t a photographic memory, and if I want to get a quote right I have to remember where I read it and dig up a copy to refresh my memory and ensure accuracy. The internet and the public and university libraries have all helped, of course, and I’m not too proud to admit that more than once I’ve borrowed a book from the library that I already owned because it was faster to do that than hunt down my own copy. Henry Petroski’s absorbing book The Book on the Bookshelf (which, ironically enough, I don’t have at my fingertips right now) goes into both the history and methodology of organizing books and discusses the problems I’ve alluded to here. In addition to such well-known systems as the Dewey Decimal and alphabetization by author’s last name, Petroski points out that there are many other ways of ordering libraries, some of which sound far-fetched but aren’t that crazy, at least for private collections. 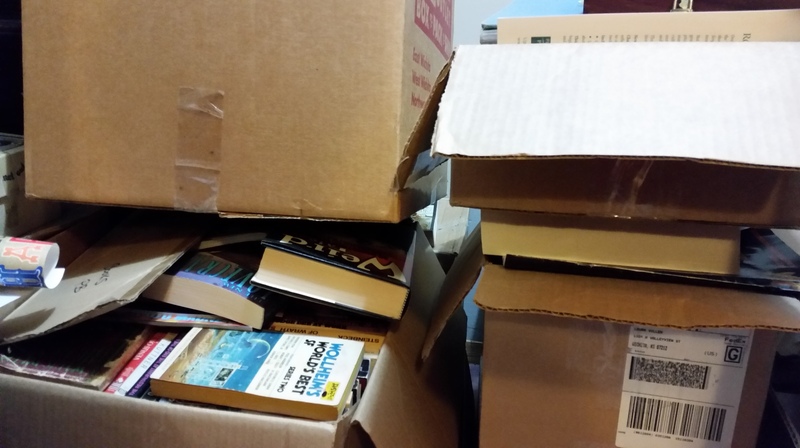 While we don’t organize public library books by size or color, for example, my own searches indicate those are just as useful for finding half-remembered books as titles or authors (books that are packed in boxes are often packed together based on size and shape rather than complementary subject matter!). All of this comes to mind after another round of shifting and unpacking boxes to find a few supplementary books for my ongoing series on motion picture serials, but I went through something similar last fall when writing a series on anthologies of different kinds (both are listed on my Series page, for those wanting to catch up). I’ll probably never have everything I own all out in the open, at least not until such time as I’m able to move into a house with shelves on every wall. It doesn’t help that I’m not a specialist, limiting my work to a core collection of volumes on a single subject. For now, at least, I’ll make due with a rotating collection, following my fickle muse. 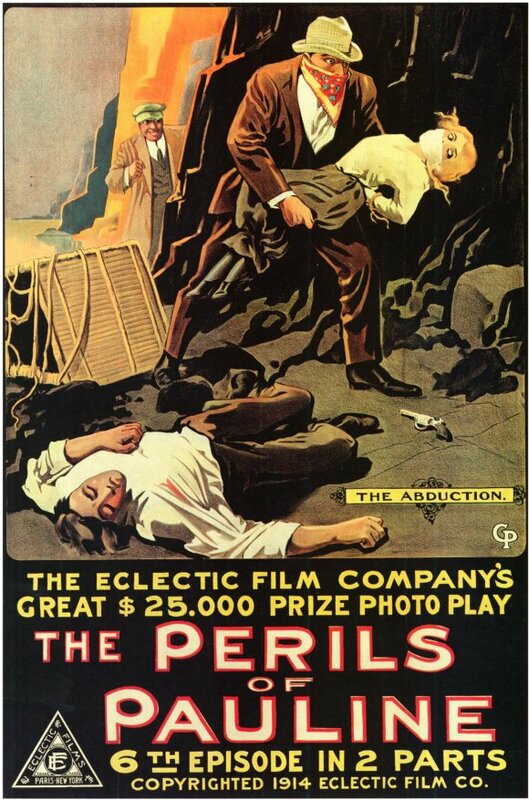 The silent serial The Perils of Pauline originally had twenty chapters, filmed in America by the French company Pathé Frères and distributed in America by the Eclectic Film Company. However, the only surviving version is from a French print edited into nine chapters, released in 1916. (In addition to the loss of scenes, this version changed the name of the villain from Owen to Koerner to sound German; since that’s the version I was able to watch I’ve stuck with calling him Koerner.) The shorter version is more than enough to get a sense of both the style and the story: the serial is entirely episodic, with each adventure introducing a different location and supporting cast, and there are no cliffhangers, each conflict being resolved before the end of the chapter. Other than the first and last chapters, they could be watched in any order, and missing some doesn’t damage the story in a meaningful way, neither of which could be said about later serials. 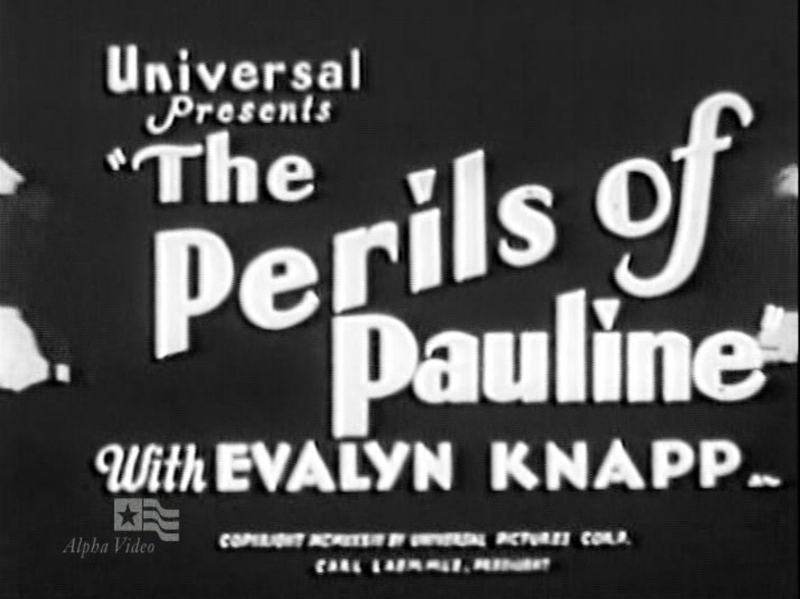 The staging and editing of The Perils of Pauline is often crude, and the English title cards are famously full of mistakes in spelling and grammar (a result of both the hurry with which the film was made and director Louis Gasnier’s poor grasp of English). Although there are humorous touches, the story is told in broad strokes: in “Goddess of the Far West,” Pauline travels to Montana and is promptly kidnapped by ruffians employed by Hicks; upon escaping from an underground burrow, she is witnessed by a local Indian who takes her for a goddess springing out of the earth. To prove herself she must race the “stone of death,” an enormous boulder, down the side of a mountain. “The Deadly Turn” involves an attempt to wreck Pauline’s car in an automobile race; “The Shattered Plane” refers to the airplane previously mentioned. By the time we see the title of Chapter Eight, “The Serpent in the Flowers,” we can be certain it isn’t a metaphor. Despite its flaws, however, the serial is saved by its star, Pearl White. White’s early life is shrouded in misinformation, much of it spread by White herself, but she had already appeared in films before agreeing to star in The Perils of Pauline, and had earned enough to tour Europe in 1913. On screen, she is active and emotes strongly, desirable qualities in a silent film actress. She is also sturdy and athletic, a far cry from the fainting violets one thinks of as the heroines of melodrama. In contrast to later decades, when a cadre of professional stuntmen doubled actors for almost any strenuous scene, silent actors generally did their own stunts, and White’s reputation partially rested on the very real dangers she put herself in. 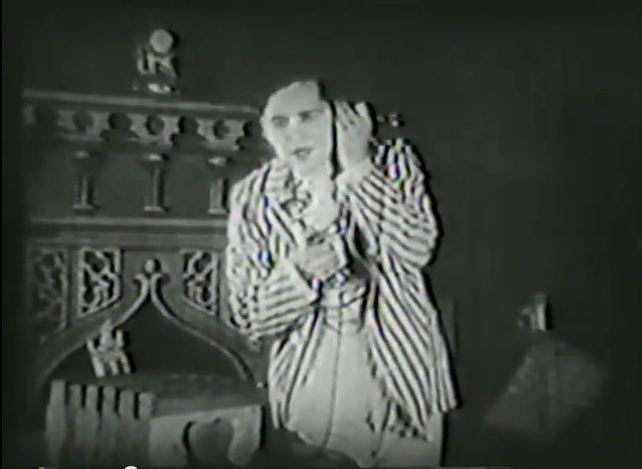 Kalton C. Lahue, in his Continued Next Week: A History of the Moving Picture Serial, relates several hair-raising incidents: the “runaway” balloon actually did come loose, coming down in a lot full of people, who promptly mobbed the star and nearly suffocated her in the gas that was escaping from the balloon. In another (apparently lost) chapter set in Chinatown, White was surprised by a group of Chinese actors who, seeking to make a good impression, beat her up with very real jujitsu. 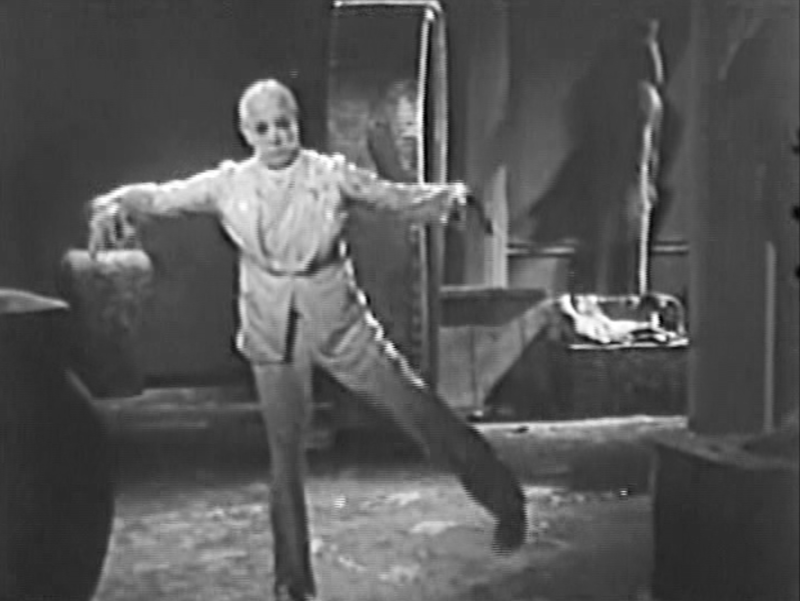 She was long troubled by an injury to her back sustained when she was accidentally dropped down the stairs while filming Pauline, and she retired in 1922 after a stuntman was killed filling in for her (in full view of a crowd, an awkward situation considering her producers still claimed she did all her own stunts as she had when she was younger). 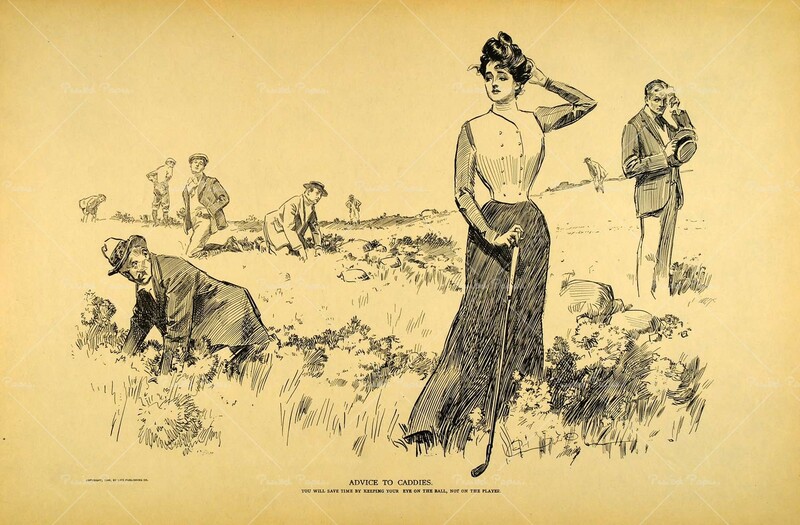 Although later generations have primarily thought of her as the archetypal “damsel in distress,” contemporary audiences saw in Pauline an independent woman putting off marriage to explore her own interests, a cinematic counterpart to the idealized women drawn by Charles Dana Gibson. 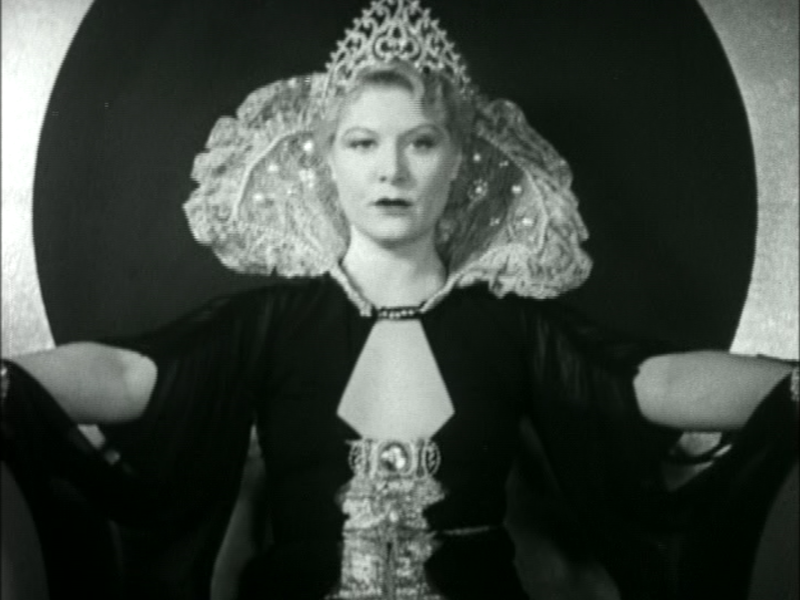 Even though much was made of Pearl White’s physical bravery, her beauty and femininity were still a selling point, and it should be noted that the wide range of settings of the Perils called for an equally large number of costumes for the leading lady to appear in: tennis outfits, boating, riding and driving costumes, and more, including the “Indian” costume she wore as the “Goddess of the Far West.” Like the Gibson Girls, Pauline was both capable and fashionable, a figure onto which many fantasies could be projected. Although it is mostly not (intentionally) humorous, it’s probably fair to compare The Perils of Pauline to the action-packed silent comedies of the day rather than the lengthy dramas that are rightly considered the pinnacle of the silent era. 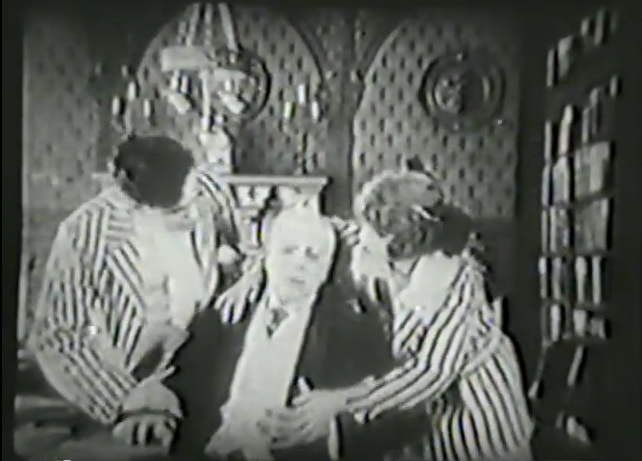 Like the comedies, serial episodes were only two or three reels in length, and the injuries Pearl White sustained in making them are comparable to the gauntlet of abuse that Buster Keaton and (later) the Three Stooges put themselves through. Just like modern action movies, the serials delight with the swiftness of their plotting and their dazzling effects rather than their keen insight into human nature, and they’re most engaging when going a little haywire. Scenes like Harry buying a car on the spot so that he can ram it into the front door of a burning house, or Pauline trapped on a ship the navy is using for target practice, make for cracking entertainment, even if they are as unlikely as the comic exploits of Keaton and Harold Lloyd. Where I Watched It: It’s on YouTube, starting here. Best Chapter Title: The title of the final chapter, “The Floating Coffin,” deserves this honor, as it was so good it was borrowed as a chapter title by several later serials. Best Peril: As I said, the chapters don’t end on cliffhangers, but the title is well earned by the many dangers Pauline faces. In addition to the race against the “stone of death” in Chapter Two, Chapter Seven (“The Tragic Plunge”) sees Pauline trapped underwater aboard a sabotaged submarine, from which she escapes by being ejected through the torpedo tube and swimming to the surface to get help. When I saw that Universal had made their own (sound) version of The Perils of Pauline, I naively thought that the producers might have kept the bare bones of the 1914 story, even as they embellished and rearranged the plot to bring it up to date. After all, the story of a corrupt guardian trying to claim his ward’s inheritance is a sturdy hook, ripe for adding the types of formulaic side characters the serials of the 1930s were known for. I didn’t expect extreme fidelity, of course: considering the changes that established characters went through in adaptation, or the fact that producers could brazenly claim something like Robinson Crusoe of Clipper Island was based on Defoe’s novel, I knew that many liberties would be taken. 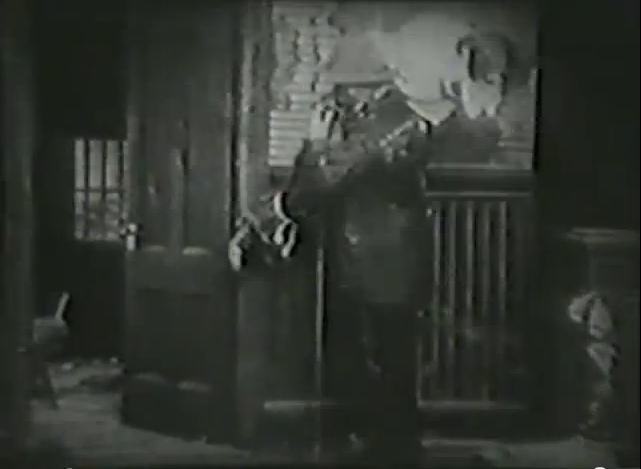 The 1914 serial had a lot of material to work with, though. In fact, several chapters of the original version could form the basis of their own serials: many Western serials were based on premises no less flimsy than “The Goddess of the Far West.” The episode I mentioned above with the sabotaged submarine had even more potential, as it introduced a spy ring and a female counter to Pauline in the person of Mlle. Yagow, whom Koerner immediately recognized as a kindred soul and potential partner in crime. In that episode, Harry and Pauline effectively guest starred in somebody else’s spy thriller, a story that could have easily been stretched to a dozen chapters. But no: Universal’s 1933 production has nothing in common with the 1914 classic except the name of the heroine (and only the first name, at that), although it does give Charles W. Goddard, who wrote the scenario of the original, a story credit. That disappointment aside, the 1933 Pauline is quite entertaining in its own right, a globe-trotting pulp adventure that is an obvious source for the Indiana Jones films and a showcase for the kind of production that Universal did well. The action begins in China, where Westerners are fleeing the oncoming Revolution. 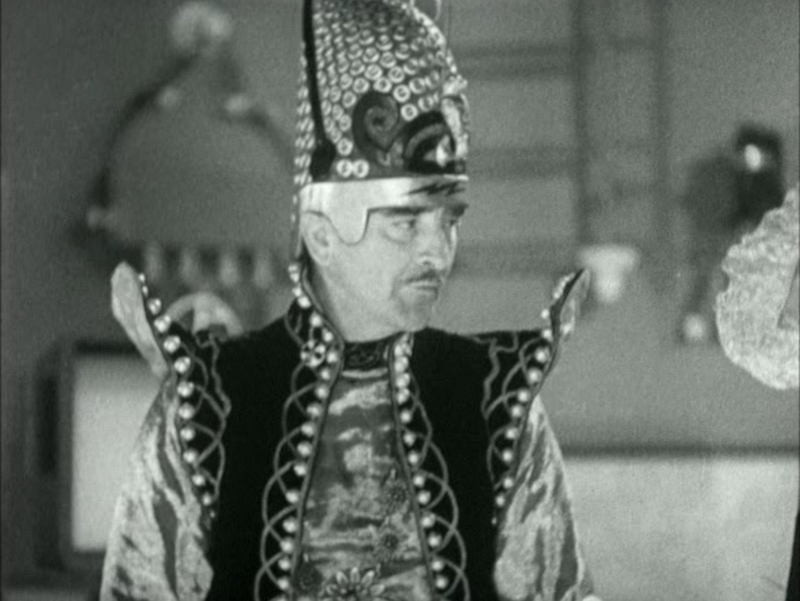 Professor Hargrave (or sometimes Hargraves: the credits, titling, and even the spoken dialogue are inconsistent on this point) is close to finding a sacred ivory disk whose secret has been entrusted to him by the Chinese monk Confu (a character never shown, but frequently referred to); even at the urging of his daughter Pauline (Evalyn Knapp) and his cowardly secretary Dodge, Hargrave refuses to leave the country until he has recovered the disk. Also searching for the disk is the “Eurasian” Dr. Bashan (John Davidson) and his scarred henchman Fang. 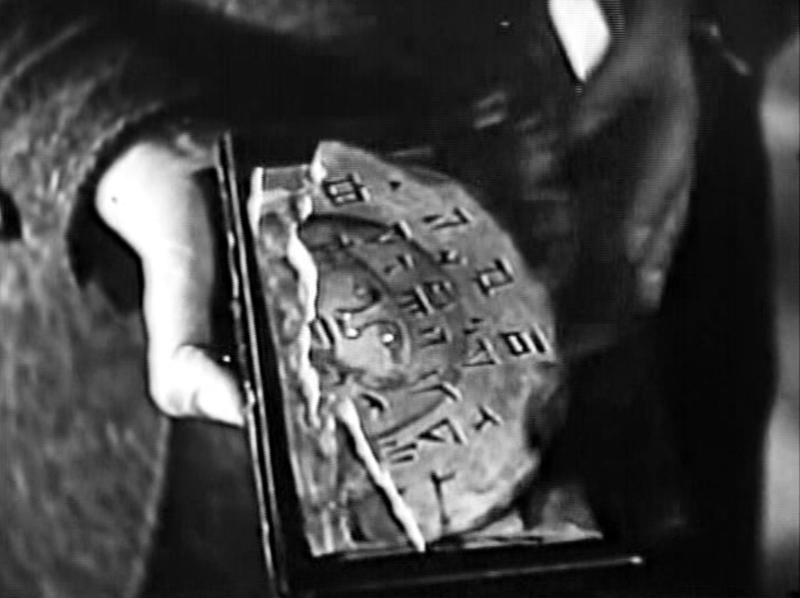 The disk contains a secret formula for an invisible poison gas that destroyed an earlier civilization; Hargrave wants to give the secret of the gas to humanity (by way of the U. S. government, of course) to put an end to war, whereas Bashan wants to use it for himself to gain power. 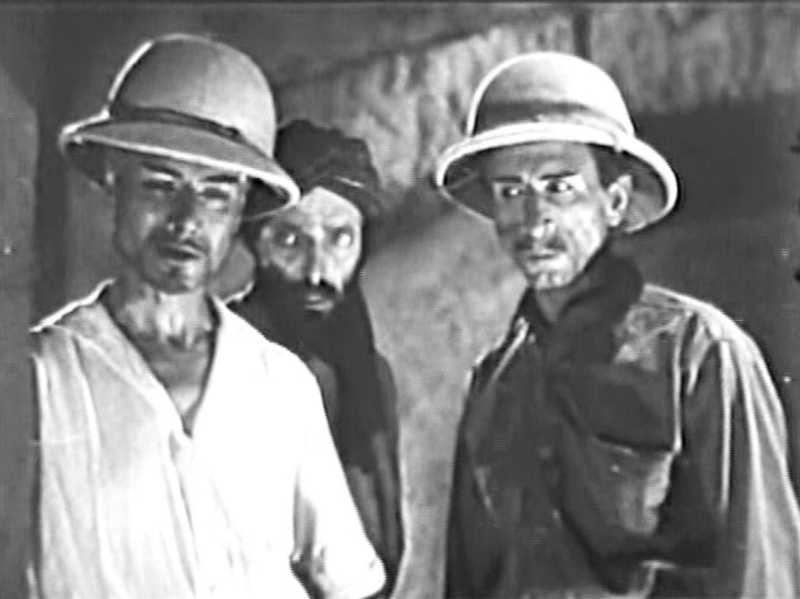 When Pauline follows Hargrave and Dodge to the Temple of Tsai Tsin, where the disk is hidden, she is rescued from Bashan and his men by Robert Warde (Robert Allen, AKA Craig Reynolds), an American engineer whose work on a Chinese railroad is about to be put to an end by the Revolution. Warde quickly grasps the situation and joins Hargrave’s team. The disk turns out to be only half a disk, and stored with it are instructions for finding the other half. From this start, The Perils of Pauline turns into an international scavenger hunt as Hargrave and Bashan follow the clues to piece together the disk and attempt to out-maneuver each other. From China they travel to Borneo, Singapore, India, and New York, facing obstacles ranging from wild animals and booby-trapped temples to assassins and gangsters. True to its title and inspiration, this version of The Perils of Pauline puts the professor’s daughter in danger in every cliffhanger, sometimes alone and sometimes with Warde or as part of the group, but the story is driven by the search for the sacred disk, not her own sense of adventure. 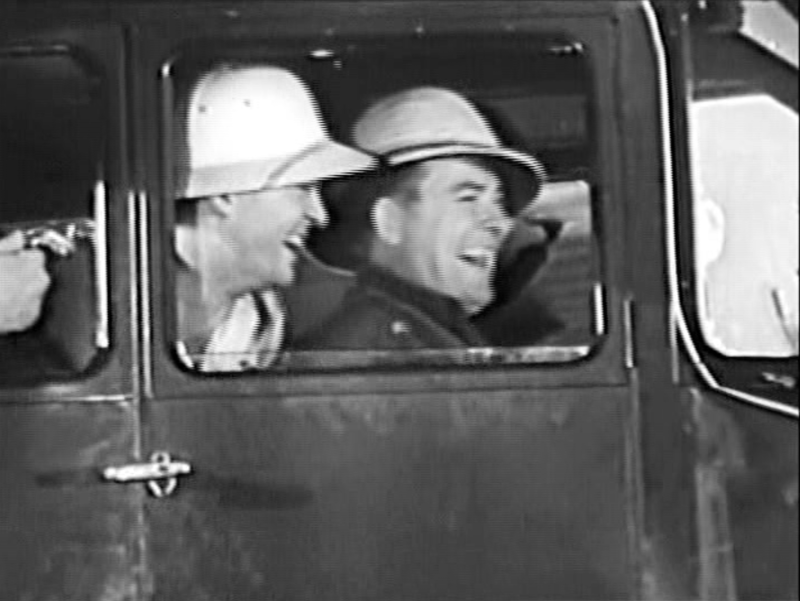 Like the 1914 version, the 1933 version finds opportunities for its star to appear in a variety of costumes both rugged and glamorous (although to be fair, the male stars go through a number of wardrobe changes as well: like Indiana Jones or James Bond, Warde is the kind of rugged he-man who takes care of business whether in khakis and pith helmet or a tuxedo). 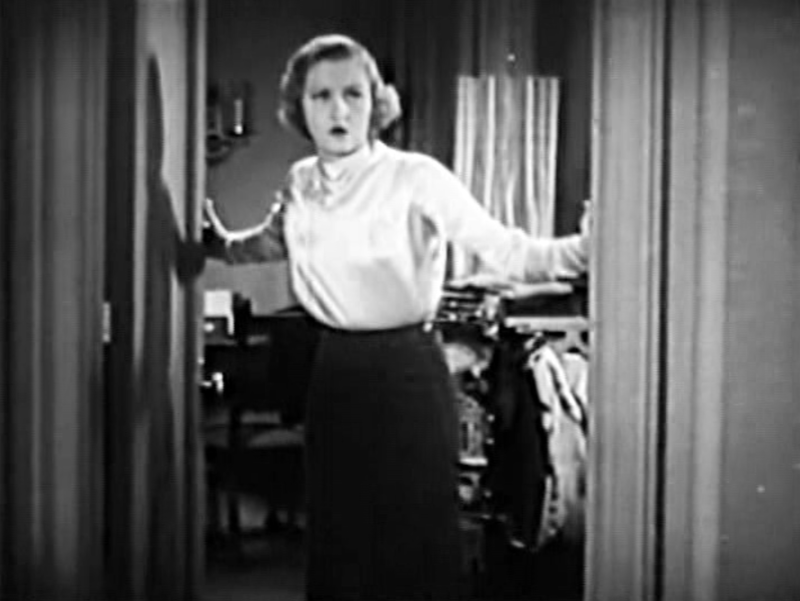 In addition, Evalyn Knapp is competing for screen time with many more characters than Pearl White had to deal with: in the context of the serials, she is the star, but that doesn’t mean she is always the center of attention. As Dr. Bashan, John Davidson (a frequent serial “heavy”) gives a magnetic performance. Bashan is a smooth operator, whose strategy is often to let Hargrave uncover the next clue, and then take it from him. 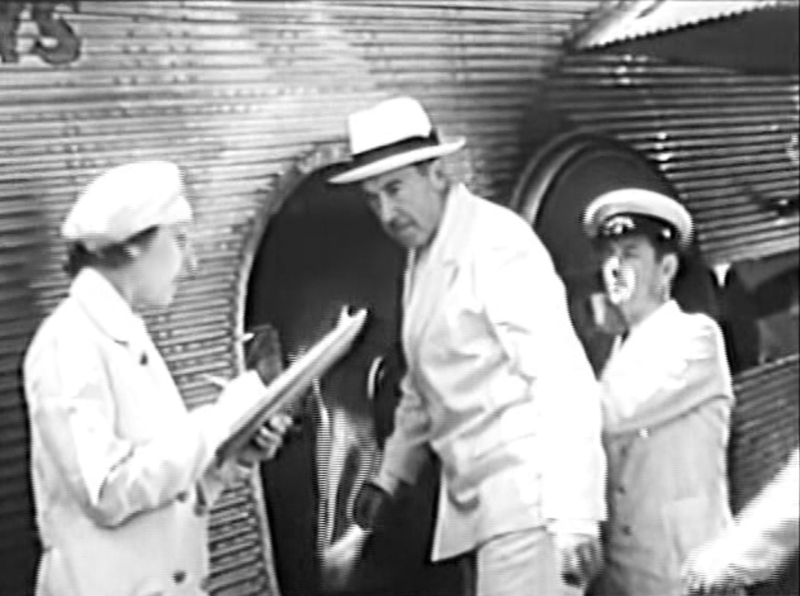 In one sequence, Bashan and Fang end up on the same flight from India to New York as Hargrave and his party, an uneventful trip that is described in dialogue as having taken five days! Did they say anything to each other in all that time, or even cross paths on the way to the lavatory? Such details are as lost to time as the empires of the past. Although Bashan and his assorted flunkies are described as “political renegades,” are they anti-colonial nationalists? Communists? Who knows? 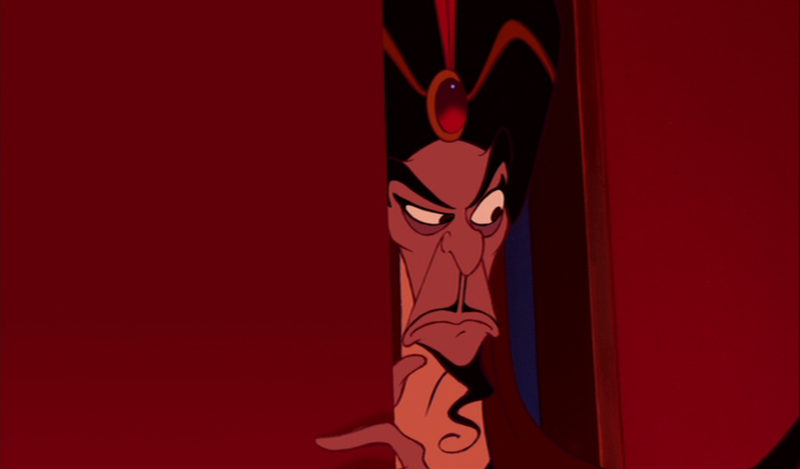 Contrary to the popular image, Bashan and other serial villains aren’t given to long-winded explanations of their political gripes; there are no trade disputes or committee hearings. They’re bad guys, and that’s all we really need to know. There is a close resemblance between Bashan’s rivalry with Hargrave and the later feud between René Belloq and Indiana Jones in Raiders of the Lost Ark: they truly are two sides of the same coin, working for different goals by similar methods. As a Universal production, The Perils of Pauline is relatively lavish, relying on the studio’s extensive collection of sets, props, and stock footage to support the world-spanning narrative, but there are times the seams show. The Chinese and Indian temples are full of Egyptian statues (excused by reference to the global civilization wiped out by the poison gas—this is a rare example where relying on a fantastic conceit like Atlantis would make the story more plausible). Every location is represented by stock footage that sometimes goes beyond scene-setting and smacks of padding. The jungles of Borneo are full of wild animals, but suspiciously few of them ever appear on screen at the same time as the characters. 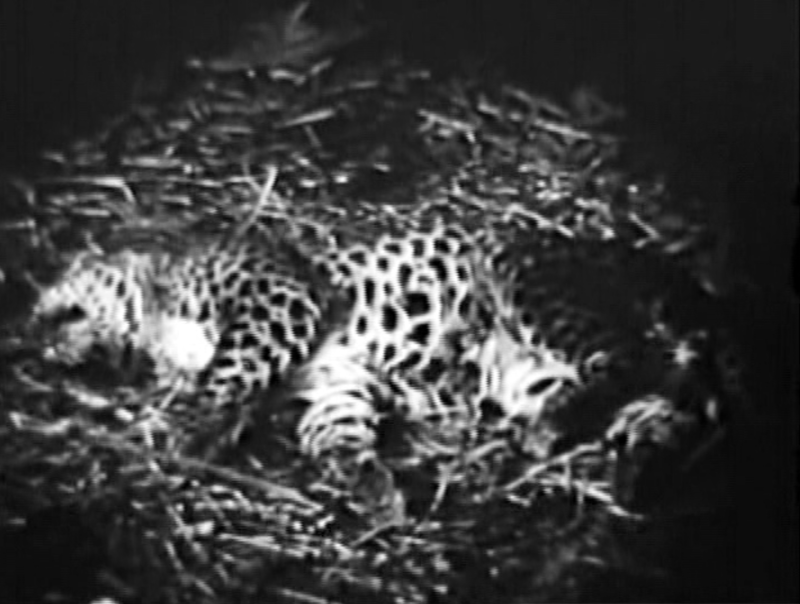 The same shot of a dead leopard appears twice in the same chapter, representing two different attacking animals. Finally, background music is only present in a handful of chapters, but its absence is made up for by a constant racket of city and jungle noise, a challenge to my perception that older movies were quieter than those made today. Still, this is a fun, action-packed serial that would be of interest to anyone looking to go back farther than Indiana Jones. Even better, it is continually surprising and inventive, right down to the last scene in which Bashan and Fang discover what the invisible gas really does—I won’t spoil it, but I’ll admit that for such a predictable outcome, it managed to surprise me. Where I Watched It: I watched an Alpha Home Entertainment DVD; it doesn’t appear to be on YouTube, except for this clip of Pauline and her father from Chapter One. Warde and his pilot friend Sullivan share a laugh after dropping hand grenades on the natives (and Bashan).
. . . Well, it’s possible I’m thinking of someone else with that last one. What’s Next: In two weeks, I revisit The Phantom Empire, the serial that made Gene Autry a star. 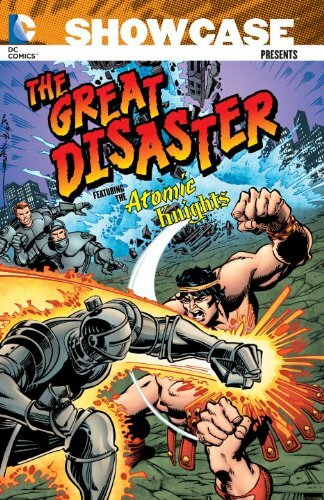 Recently, DC Comics published a trade paperback collection under the unwieldy title Showcase Presents: The Great Disaster Featuring the Atomic Knights. I don’t intend this essay to be a review, but I will say up front that if mid-century visions of nuclear war are your bag, there’s no reason not to pick this up. If you’ve read any volumes of Showcase (or Marvel’s similar Essential series) before, you know what to expect: more than 500 pages of black-and-white reprints (of stories from the 1960s through the 1980s in this case) on cheap paper at a low price. They don’t call ‘em “phone books” for nothing. I was eager to get this volume (it had been previously announced several years ago and then delayed) for a few reasons. First, I was a big fan of post-apocalyptic fiction when I was younger, and comic books were no different from other media in exploring that theme. Second, although I had read some of the stories included, many were unfamiliar to me, and this would be a good way to fill in some gaps. Finally, the focus on a central event (and one which had been interpreted many different ways by writers over the course of decades) makes this volume a little different from the typical Showcase that either follows a single character or collects completely unconnected stories (like the anthology title House of Mystery). Some effort was made to arrange contradictory material into a single chronology, and that kind of editorial undertaking is always of interest to me. Does it succeed? Eh, sort of. On one hand, the title tells you a lot about what’s in the volume: several cycles of stories centered on the destruction of civilization as we know it. 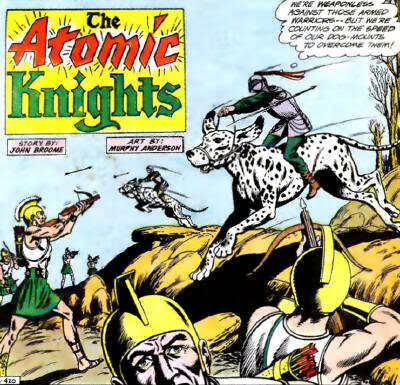 The Atomic Knights, in a series of stories by writer John Broome and artist Murphy Anderson that began in 1960, travel the wastes of post-World War III America, surviving with the help of their suits of medieval armor (discovered in a museum and possessed of miraculous radiation-shielding properties). The only other continuous series represented in this volume is Hercules Unbound, but there are a number of stand-alone stories (many under the umbrella title “The Day After Doomsday”) as well. 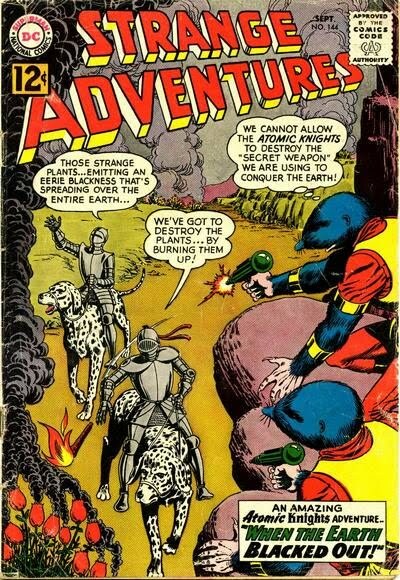 On the other hand, the Great Disaster doesn’t have the instant name recognition of a superhero, nor was it the title of an ongoing book (the Atomic Knights, for example, were found in the pages of Strange Adventures; I wouldn’t be surprised if they were added to the title of this book so that at least some character would be named on the front cover). In fact, the Great Disaster isn’t even synonymous with World War III in DC continuity, but you have to dig pretty deeply into the book to figure that out. The Great Disaster is (or was, pre-Crisis) a conveniently vague apocalypse in the background of Jack Kirby’s Kamandi, involving weapons of mass destruction as well as natural disasters, taking place at some point after WWIII. Aside from Planet of the Apes, the world of Kamandi bears a close resemblance to the campaign setting of Gamma World, a role-playing game from TSR, the makers of Dungeons & Dragons. In transposing the adventuring-party model to a post-apocalyptic science fantasy setting, the game designers gave players the option of playing as a “pure strain” human, (humanoid) mutant, or mutated animal. From one angle, the title character of Kamandi (“the last boy on Earth”) and his companions, the superhuman Ben Boxer and dog-man Dr. Canus, could be player characters in a Gamma World game, and their travels from one wonder to another, piecing together the fragmented history of their world and facing down monsters and villains, are not unlike an ongoing RPG campaign. 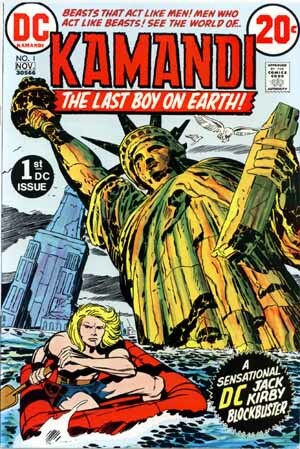 Alas, Kamandi does not appear in Showcase Presents: The Great Disaster. The material reprinted from Kamandi #43-46 is a backup story focused on Urgall, a gorilla whose liberal ideas (extending respect not only to non-gorillas but to humans, and even female gorillas!) put him at odds with his tribe. (Another “tale of the Great Disaster” that appeared in Weird War Tales #51-52, featuring warring English and Scottish dog-men, is not included, which is too bad, as it is superior to the story of Urgall.) I’ve gone into detail about Kamandi because I’m a fan, and having collected (I believe) all the pre-Crisis appearances of Kamandi and OMAC, it’s hard for me to not bring that context to the present book. As of this writing, the only collected reprints of Kamandi are more lavish and expensive than the Showcase series, but the title is worth seeking out and is really more essential than anything in this book (but if you’re reading this, you already knew that, right?). When I first read the Atomic Knights stories (about fifteen years ago), they struck me as more than a little silly: in addition to the conceit of medieval armor protecting against radiation, the stories were burdened with outdated gender roles (the “littlest knight,” Marene Herald, mostly stays out of the way, awaiting the day that team leader Gardner Grayle will propose to her) and too many convenient “scientific” solutions to problems. Although the war is said to have occurred in October, 1986, the Atomic Knights’ roots in the early 1960s remain obvious. Reading them again, however, I’m more sympathetic to the earnest tone: the Knights are at the vanguard of rebuilding democracy, and the stories often end on a didactic note, preaching the need for cooperation, compassion, and emphasizing reason and the rule of law. Many of the menaces they face will be familiar to readers of post-apocalyptic fiction: problems of supplying food and energy when nothing will grow; human populations regressed to caveman-like savagery; would-be dictators such as the fascist “organizer” Kadey and the self-proclaimed King of New Orleans; and non-human threats either produced by radiation (a Triffid-like strain of mobile, intelligent plants) or opportunistically filling the void left by the collapse of humanity (a race of underground mole people who plan to permanently darken the sky so that they can take over the surface world; scavenging space aliens searching for precious metals). That the Atomic Knights continue striving and are able to keep their humanity as they do so is, in its own way, optimistic. It was when the Atomic Knights encountered warriors from the legendary island of Atlantis, time-warped into the future by their own scientific catastrophe, that I was able to put my finger on the story-telling mode. Replace “radiation” with “magic,” and a story in which armored knights battle Romanesque soldiers from an ancient island could be part of any fantasy novel from the last hundred years. Specifically, the discovery of “Atlantides” (as the islanders are called in this story) fits neatly into the “lost world” genre: as practiced by H. Rider Haggard, A. Merritt, and Edgar Rice Burroughs, among others, there was always the possibility of a remote valley, cave, or island that history and evolution had passed by, leaving a population of dinosaurs, ancient Romans, or other living relics to be discovered. The lost world genre was mostly finished off by World War II, as the empty, unknown spaces on the map were filled in; wiping the slate clean with a global catastrophe allowed writers to open those spaces up again, and fill them with mystery and adventure. In these stories, the lost world was our own. Perhaps that is one reason they continue to be popular: although seemingly pessimistic, this strain of post-apocalyptic fantasy, showing places and objects of the present through the eyes of later generations, provides for a kind of reenchantment of the everyday. We gain perspective when we imagine a bustling city full of skyscrapers as empty and crumbling; more importantly, we can appreciate how marvelous our technology is when we picture later generations trying to make sense of it. In the Gamma World game, there was a mechanism for player characters to puzzle out the use and meaning of “artifacts,” meant to prevent players from using out-of-game knowledge to identify, say, a rifle as a weapon rather than an emblem of office. Similar misinterpretations are a staple of the genre: picture the subterranean mutants of Beneath the Planet of the Apes worshipping a nuclear missile as a god, or a young shaman trying to divine omens with a vinyl record in Mad Max Beyond Thunderdome. Likely inspired by real-life cargo cults, the projection of superstitious beliefs onto modern goods allows writers to remix old and new cultural symbols, comment on our relationship to technology, and—that standby of science fiction—map contemporary political concerns onto fantastical stories. It should go without saying that the stories of Kamandi and the Atomic Knights don’t have anything to do with the likely horrors of a real nuclear war (or whatever the Great Disaster was supposed to be), and the longer their stories continued, the more fantastical and obviously escapist they became. 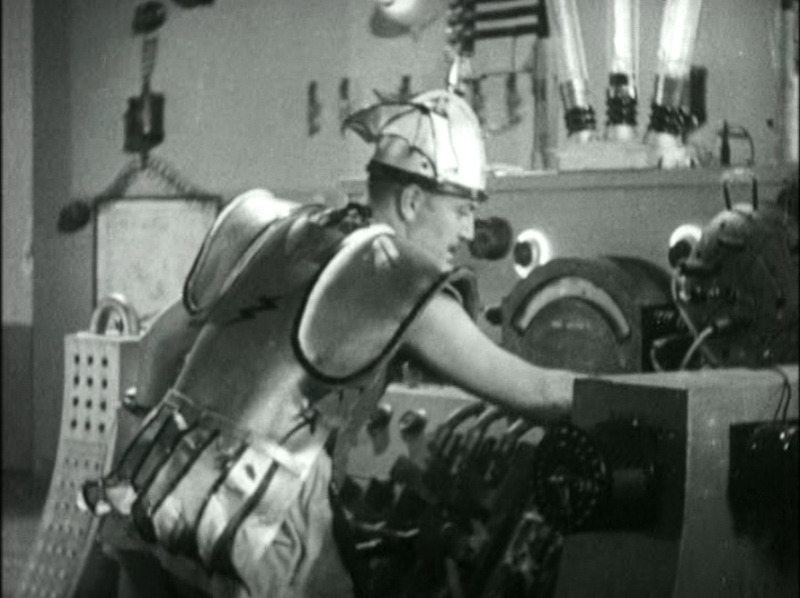 In the final story included in Showcase Presents: The Great Disaster, no less a DC eminence than Superman himself encounters the Atomic Knights, only to discover that their entire history is the dream of Gardner Grayle, placed in a sensory deprivation tank as part of a military experiment. Grayle’s unconscious mind has taken over the computers running the simulation and threatens to launch an actual nuclear strike in order to make real the fantasies in which Grayle has played the hero for years. I think it’s a little much to criticize escapism, however, when the target audience has so little power to change the situation from which they are escaping. It’s one thing to indict military planners running simulations with potential real world consequences, another to criticize something as obviously fanciful as the Atomic Knights or Gamma World. Speaking as a cold war baby who was ten years old in 1983 and absolutely terrified of nuclear war, the only other alternative was denial: I could hardly watch the news without having a panic attack, and I had no desire to subject myself to The Day After when it aired (I’m glad I didn’t know anything about the even grimmer Testament and Threads at the time). 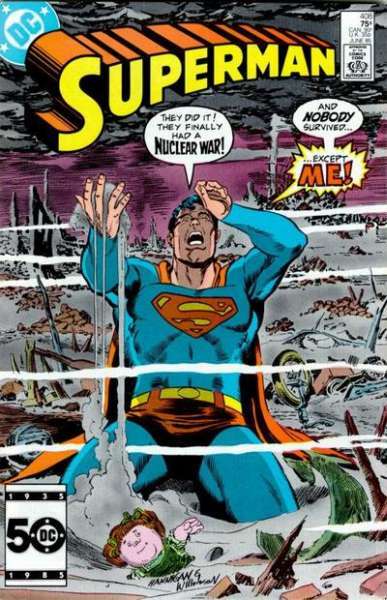 Nuclear war was also frequently on Superman’s mind in the 1980s: most fans today remember Superman IV and the Man of Steel’s quest to rid Earth of nuclear weapons, but in the comics Superman often stood aside as an observer, willing to admonish mankind but not make the hard decisions for us. Visions of humanity’s capacity for self-destruction haunt him: a Superman who does nothing to prevent a holocaust is not super in any way, but were he to take the choice out of our hands he would become a god rather than a man. This version of Superman as advocate and guardian challenges the view of comic book readers as naïve simpletons waiting to be rescued. The focus in popular culture changed after the passing of the Cold War; although the apocalypse has never been far from our entertainment, the end of the world can come from almost any direction nowadays: terrorism, climate change, pandemic, just to name the more realistic possibilities. Free-floating dread has replaced the pointed terror of “Mutually Assured Destruction;” chaos is more feared than ideology, and it’s reflected in the zombie hordes and rampaging kaiju of current film. Still, the stories I grew up with haven’t been forgotten: perhaps it’s driven by ‘80s nostalgia, but remakes or reboots of Planet of the Apes, Mad Max, and even WarGames have either been made or are in production. 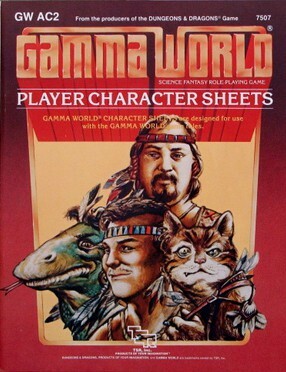 Gamma World has been through seven editions, the last in 2010, although I haven’t played in years. 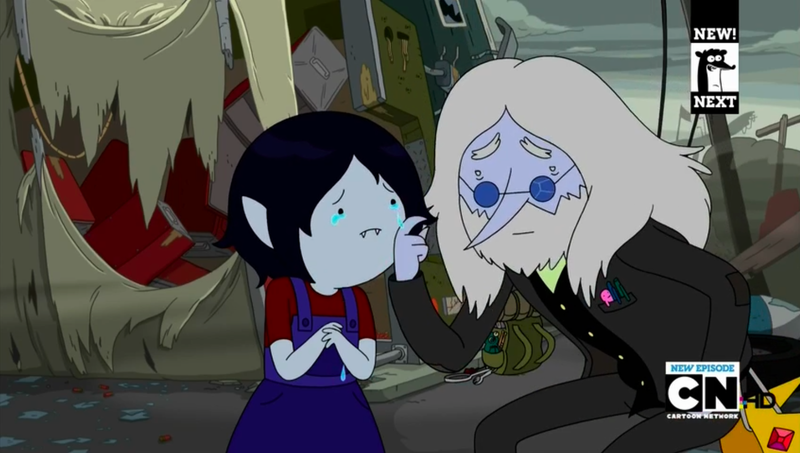 The intoxicating cocktail of sword-and-sorcery among the ruins of modern civilization is still with us in such programs as Adventure Time. Earth A. D. is still a place that many of us like to visit, even if we wouldn’t want to live there. Going to the park or downtown to watch the big professional fireworks show is always an enjoyable spectacle; no patriotic or sporting event is complete without them. When synchronized with music they can be even more dramatic. 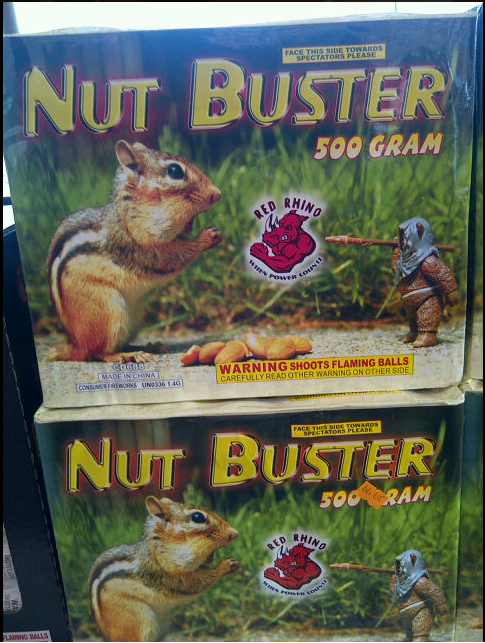 However, I’ve always enjoyed the hands-on aspect of the fireworks you can buy and shoot off yourself. The sulfurous smell, the shredded paper, and even the burnt fingers bring back memories of family gatherings and idle summer days. Where I grew up, in Kansas, fireworks were legal for about a week around July 4, although a window has now opened for New Year’s Eve as well; I was both awestruck and jealous when I visited my cousins in Tennessee as a kid and learned that they could buy and shoot off fireworks all year round. 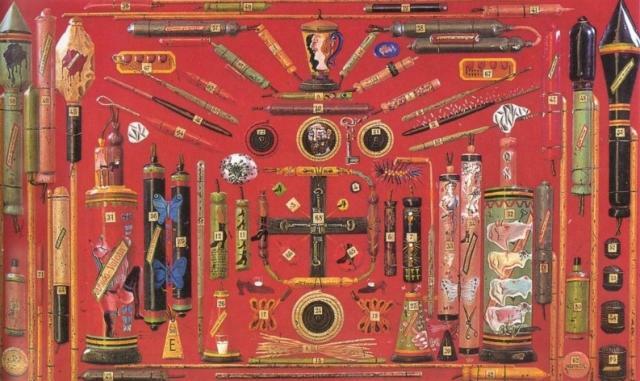 I also enjoyed the packaging and was intrigued by the Chinese script and traditional designs, a vintage commercial style that inspired Salvador Dali to paint his Board of Demented Associations (Fireworks) in the early 1930s. 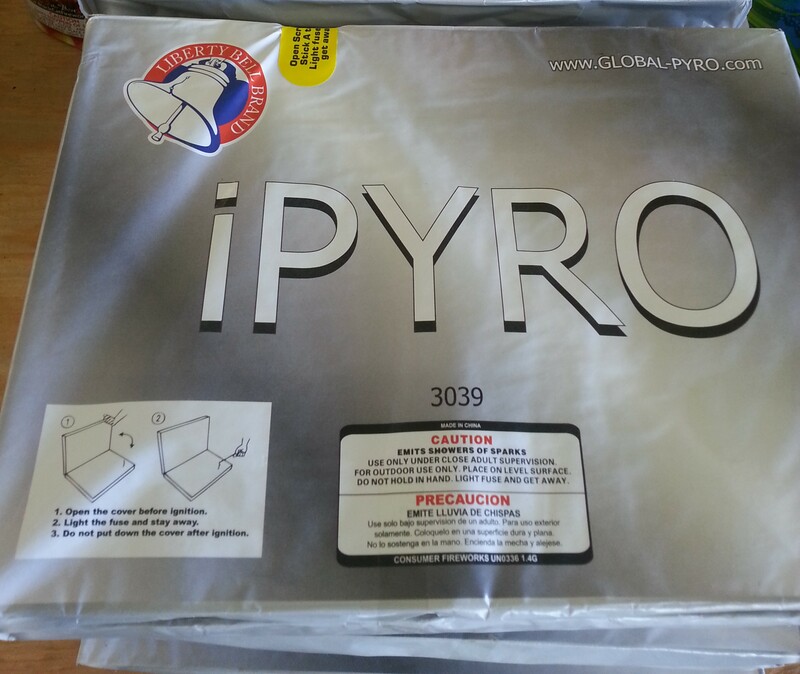 Fireworks with traditional packaging can still be found, but in recent years I’ve noticed a more trend-driven approach to packaging, with the larger fireworks especially trying to stand out in a crowded marketplace with photoshopped labels that look like movie posters or glossy magazine ads, and names that reflect their Chinese manufacturers’ idea of American pop culture. (They’re even rated, with the “Wizard’s Wrath,” for example, rated “A for Action.”) Considering how difficult it can be to distinguish between numerous models that all promise to “emit showers of sparks with loud report,” they need any advantage they can get. There are also the unauthorized “Captain Americas” (an obvious choice) and illustrations that look sort of like Darth Vader or other characters. There was a Britney Spears firework for a while but I haven’t seen it recently. To all my American readers: have a happy and safe Independence Day!